The Perpetual Traveler: Style Note: "Evil Mega Mart" is now "Acme Corporation"
Style Note: "Evil Mega Mart" is now "Acme Corporation"
In earlier posts on this blog, I have referred to the "Evil Mega Mart™" (or EMM™), a certain giant megalithic corporation from which most goods for the blissful homeless life are obtained (at least in North America). I realize now that the label may be inappropriate. 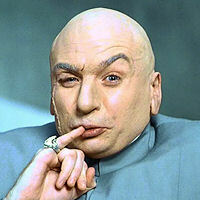 It isn't necessarily "Evil". It just is. Henceforth on this blog, this megalithic retail organization shall be known as the "Acme Corporation"--in homage to the outfit that supplied Wile E. Coyote with roadrunner-catching equipment. True, the equipment always failed, but Acme was unmatched on fast delivery, often arriving within seconds of the Coyote placing his order. 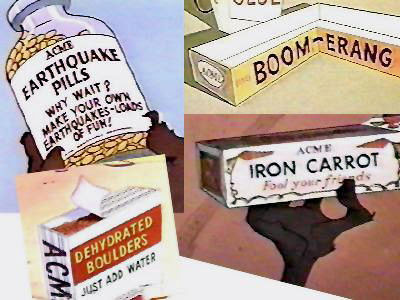 Acme can't really be blamed if its products are used for nefarious purposes; that's the customer's choice. Likewise, it may not be fair to blame a single American corporation for all of society's ills. Acme/EMM simply gives the customer what he wants, and if his motives are impure, then the customer himself must bear the burden for the results. Without a doubt, our Acme is an enormous boon to the traveler. Its standardized installations in every significant city and town mean that you never have to search for basic goods like sleeping bags, shoes or fresh underwear. At Acme, you know you'll find what you need at reasonable prices. The quality may not be superior, but it's consistently adequate from place to place, which is all you really need for survival. There are lots of bad things you say about the social affects of Acme -- how it has cannibalized small businesses and downtowns across America, replaced high paying jobs with subsistence ones and encouraged sweatshop labor overseas -- be we all shop there anyway, and it isn't clear that you're helping the world by not doing so. Acme is simply an unavoidable public institution, like the U.S. Government or Christianity. You either learn to live with it or you don't. I visit Acme without guilt. When I'm driving, I may stop there as many as three times a day, for the restrooms if nothing else. Most Acme Supercenters ("Supercentres" in Canada) are open 24 hours a day, so you can drop by anytime. Acme parking lots in rural areas explicitly allow overnight parking, even by mammoth RVs. You don't have to buy anything to take advantage of these services, so why not use them? Apart from food, there are about a dozen standard supplies I buy at Acme, including $9 sleeping bags, $2.50 pillows, $12 shoes, $5 shirts and $10 jeans. (Just about the only item I don't buy there is tents, which I can usually get cheaper at a chain sports store.) I don't feel that Acme is making a huge profit off me, but I'm getting a fantastic deal from them. At those prices, I can afford to throw away my bulkier supplies when I need to, then reconstruct my inventory at my next landing spot. Attached to every piece of merchandise is some pain. Acme can sell at such low prices because some sweatshop worker in China is earning only pennies a day making it. Just because I don't see the exploitation myself doesn't mean it isn't happening. But if I don't buy the cheap product, am I really helping those exploited workers or simply putting them out of work? It's a genuine conundrum, and I deal with it in my own mind but not buying frivolously. If I buy something, it is because I truly need it and will use it well, not because it serves my vanity. I don't know if I am helping or hurting world society, but at least I am treading lightly through it. In the Road Runner cartoons, the Coyote always gets what's coming to him. Acme sells him devices that always backfire, but he never learns from his experiences. I, too, have purchased Acme products that have fallen apart on first use, but I think I have learned a thing or two. Usually they were products that I didn't truly need anyway. Once my motives became more pure, my bad experiences at Acme dissipated. Once I stopped trying to kill Road Runners, Acme and I have learned to get along. Sometimes even devout liberals can (or choose to, as you have ) admit that not all capitalism is bad. I remember when I would have to drive to 4 diff hardware stores to find what I needed(using fuel all the way). Also, having to go to several small mom pop shops to find what i wanted and at good price.IE Acme. I really enjoyed you blog and marked it so I can read more of later when I am not sleeping.